Ciara O’Toole had it all planned, when life took a wrong turn. Deciding to make the best of it, she made an astounding and life-changing comeback leading to extensive personal and professional success. Now a self-published author, Ciara recently worked in the not-for-profit world before founding an aviation inspired business producing art and furniture out of reclaimed aircraft. Ciara O’Toole is a serial entrepreneur, author and pilot who obtained her seaplane licence on Italy’s Lake Como. Born in Dublin, Ciara now lives in Como, where, despite best laid plans, her life took an unusual turn. Making the best of her situation, she made an astounding comeback which ultimately led to a voyage of adventure, self discovery and extensive personal and professional success. This includes publishing a memoir called ‘Going Solo on Lake Como’. A marketing specialist by profession, she has worked for some of the world’s biggest brands such as L’Oreal Paris, Red Bull and Diageo. 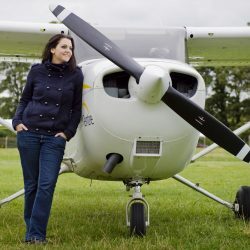 She has successfully raised investment for her own ventures, including an aviation based design start up and has experienced first hand the highs and lows of chasing success. Ciara has been described as ‘authentic & inspirational’, ‘warm and funny’ and ‘a tough cookie with a big heart’. Her engaging honesty and unique story make her an ideal and entertaining motivational keynote speaker or panelist, illustrating that with the right attitude and tenacity, anything is possible.